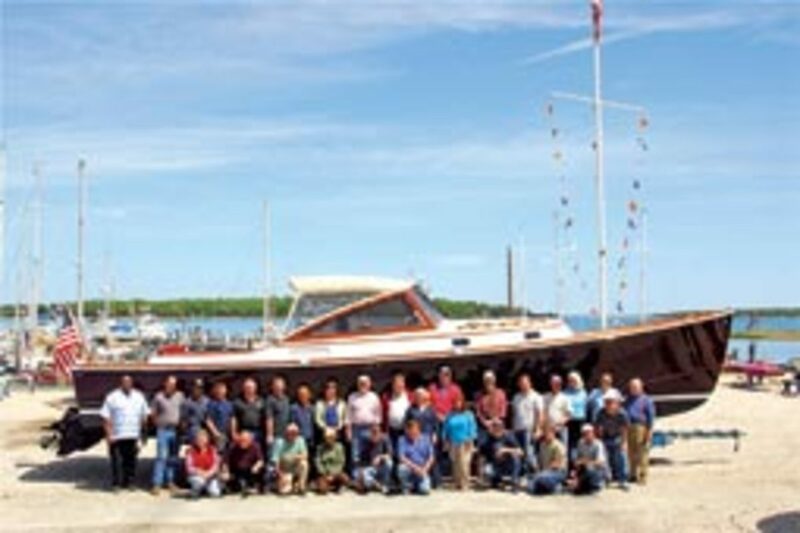 Coecles Harbor Marine in Shelter Island, N.Y., launched the 50th Shelter Island Runabout. Conceived by singer/songwriter Billy Joel and designed by Doug Zurn, the first runabout was built for Joel and launched in 1996. Hull No. 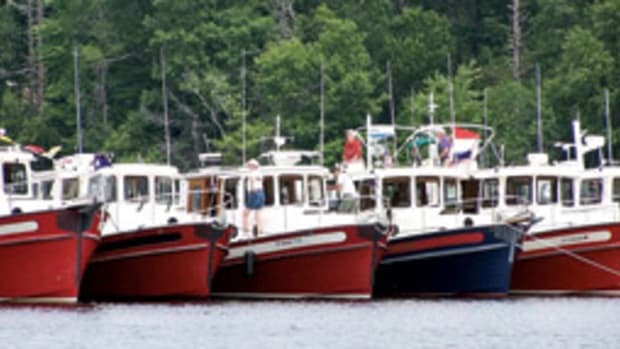 50 is for a second-generation owner, whose father launched hull No. 2 in 1997. It is equipped with twin Yanmar 315-hp diesels and Teleflex electronic engine controls. Top speed is 48 mph with a cruise speed of 41 mph. Typical fuel consumption is 11.2 gallons per hour at 29 mph with a cruising range of 446 nautical miles at that speed. Hull No. 50 has a cockpit designed by the new owner and is custom-built. Instrumentation features the Northstar 8000i touch-screen GPS/chart plotter. Both wired USB and Bluetooth wireless supports MP3 players including Apple&apos;s line of phone and music storage devices. Down below features varnished teak trim and a teak-and-holly cabin sole. 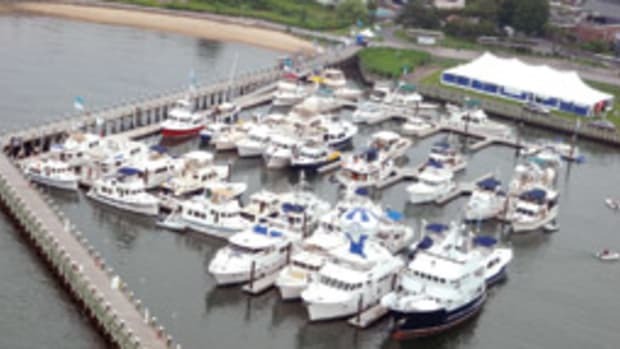 Soundings readers have been invited to view 30-plus exceptional yachts July 16-17 at the Carnegie Abbey Club in Portsmouth, R.I.
invitation-only lifestyle show featuring a variety of luxury and high-end exhibitors. There is no charge at the gate. Soundings is a sponsor for the event. 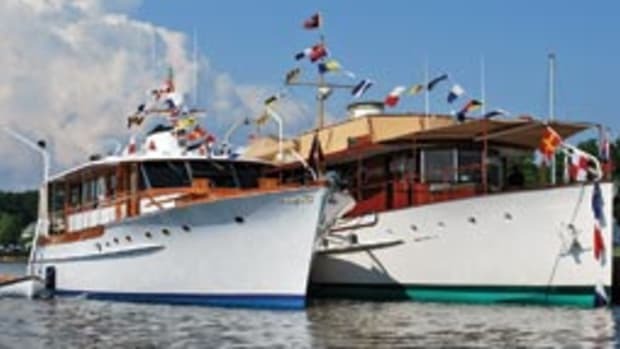 Vessels on display include models from Vicem Yachts, Riva, The Hinckley Company, Hunt Yachts, CW Hood Yachts, Protector, Naiad Inflatables, Trumpy Yachts, Grand Banks Yachts, Fortier Boats and Mochi Craft. 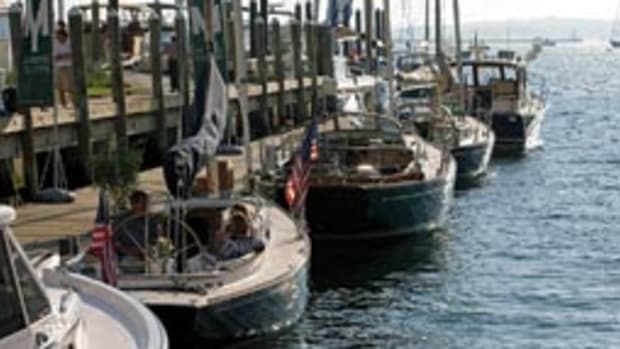 "We&apos;re describing the show as ‘exceptional yachts, autos, residences and diversions,&apos; " says Bob Peck of Atlass Insurance, one of the creators of the show. Other luxury items on display will include cars, real estate, gourmet dining, art and clothing. Newport Private Viewing was conceived as a way for companies to self-promote and better reach their markets, says Peck. This is the third running of the event, but the first year it will take place at the Carnegie Abbey Club. "Our customers are still buying," he says. 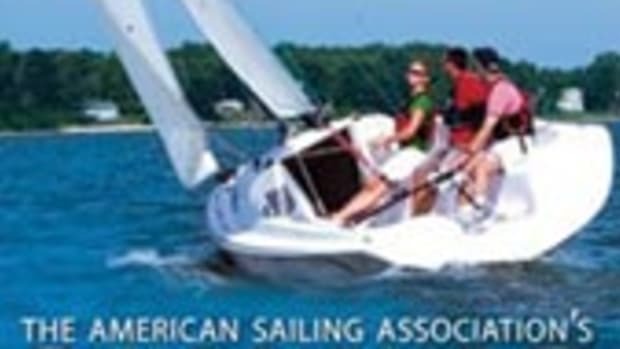 "But now people who might have planned to buy, say, an 80-footer might, instead, buy a daysailer. The buyer still wants quality, though." The show runs from noon to 6 p.m. July 16 and 10 a.m. to 4 p.m. July 17 at the Carnegie Abbey Club at 125 Cory&apos;s Lane in Portsmouth, R.I. Parking is available. Country music star Brad Paisley will headline the AquaPalooza 2010 signature event, scheduled for July 10 at The Reserve at Lake Travis near Austin, Texas, according to Sea Ray Boats. The event, hosted by Sea Ray and its local dealer Sail & Ski Center, will have Paisley performing in front of a crowd of thousands of concert-goers on boats, floats and kayaks. For those who can&apos;t make it to Lake Travis, Sea Ray dealerships around the world will transform more than 100 additional locations into official AquaPalooza event sites, making it easy for boaters to get to and enjoy the family fun. Most events will take place the last two weekends in July. Yamaha Marine Group rolled out its VMax HPDI Summer Sale promotion. The promotion provides the purchasing consumer a credit of up to $3,000 based on MSRP toward the purchase of goods and/or services available at the authorized participating Yamaha outboard dealer that sold the eligible Yamaha outboard. Eligible Yamaha outboards include new 150- to 300-hp VMax HPDI 2-stroke outboards that are sold, warranty-registered and delivered to the consumer from June 1 through Aug. 3. This article originally appeared in the Connectictut & New York Home Waters section of the August 2010 issue.